VERSALAB Auto is compatible with any Windows operated computer for data transfer for storage and patient reports. The software has various configurations to conduct ABI/TBI, PVR, Segmental Doppler for lower extremity, Upper Extremity, Carotid examination and Penile flow studies along with the pressues indicesses. This model is a fully automatic model that capture waveforms and blood pressues on its own for accuracy. The built-in quality control helps to detect the accurate and correct systolic BP of all the limbs. 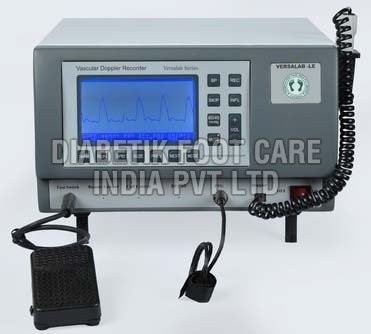 Our clients also call this equipment as diabetic doppler.